Marine seismic surveys used in petroleum exploration could cause a two- to three-fold increase in mortality of adult and larval zooplankton, new research published in leading science journal Nature Ecology and Evolution has found. Scientists from the Institute for Marine and Antarctic Studies (IMAS) and the Centre for Marine Science and Technology (CMST) at Curtin University studied the impact of commercial seismic surveys on zooplankton populations by carrying out tests using seismic air guns in the ocean off Southern Tasmania. The research found that the air gun signals, commonly used in marine petroleum exploration, had significant negative impact on the target species, causing an increase in mortality from 18 per cent to 40-60 per cent. Impacts were observed out to the maximum 1.2 kilometre range tested, 100 times greater than the previously assumed impact range of 10 metres, and all larval krill in the range were killed after the air gun’s passage. Lead author, Curtin University and CMST Associate Professor Robert McCauley, said the results raise questions about the impact of seismic testing on zooplankton and the ocean’s ecosystems more widely. 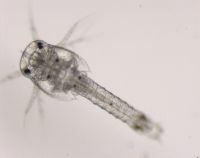 “Zooplankton underpin the health and productivity of global marine ecosystems and what this research has shown is that commercial seismic surveys could cause significant disruption to their population levels,” Associate Professor McCauley said. The study, jointly funded by Curtin University and the University of Tasmania, involved two replicated experiments carried out on consecutive days using a 1.6km survey line in Storm Bay, southern Tasmania. IMAS Associate Professor and research co-author Jayson Semmens said a series of sonar lines run perpendicular to the air gun line were monitored prior to, and immediately after the air gun run. "These sonar runs 'imaged' the zooplankton, and showed a lowered zooplankton presence starting 15 minutes after the air gun passed, with a large 'hole' in the zooplankton evident 30 minutes after the air gun pass,” Associate Professor Jayson Semmens said. This 'hole' or region of lowered zooplankton presence was symmetric about the air gun line and increased through time. The abundance levels of living and deceased zooplankton were also tested in the same area, before and after the seismic survey testing. “We counted the number of live and dead zooplankton collected in nets using a special staining technique and found that two to three times as many zooplankton were dead following the air gun operations than those collected before,” Associate Professor Semmens said. Associate Professor McCauley said he hoped the research would prove useful in assisting regulatory authorities to monitor and manage marine seismic survey operations, in understanding how these surveys impact marine systems and how we may reduce such impacts.